I've have gotten the skirt attached and mostly finished. The main part of the skirt is made from one large rectangular piece, with a french seam down the center back. The full circumference is just a little less than 4 yards, all I could spare from the limited fabric I started with. I did several things different with this skirt than with previous skirts. This skirt is not lined, in the interest of keeping the whole thing lightweight. And instead of padding the top of the skirt where it is pleated, I sewed in a double folded piece of starched silk organza, which still adds structure, but no more bulk or weight. In the portrait it can be plainly seen where the padding is either sewn or ends, at the waist. Even though I sewed the organza down to the green silk at its bottom it is not all that visible from the outside. I am hoping that it will kinda 'puff' up once its been washed once or twice and be more visible. There is also a very visible diagonal seam on the right side of the portrait, which I assume it there due to the original skirt having to be pieced. One thing I have not played much with is with period skirt patterns, usually due to starting off with minimum fabric and being scared of what might be wasted in the cutting and piecing. I went with more a box type pleat than a cartridge pleat on this one, as I felt it more accurately represented the pleats in the portrait and would work better with the unpadded silk. I then moved on to the hem and guard. 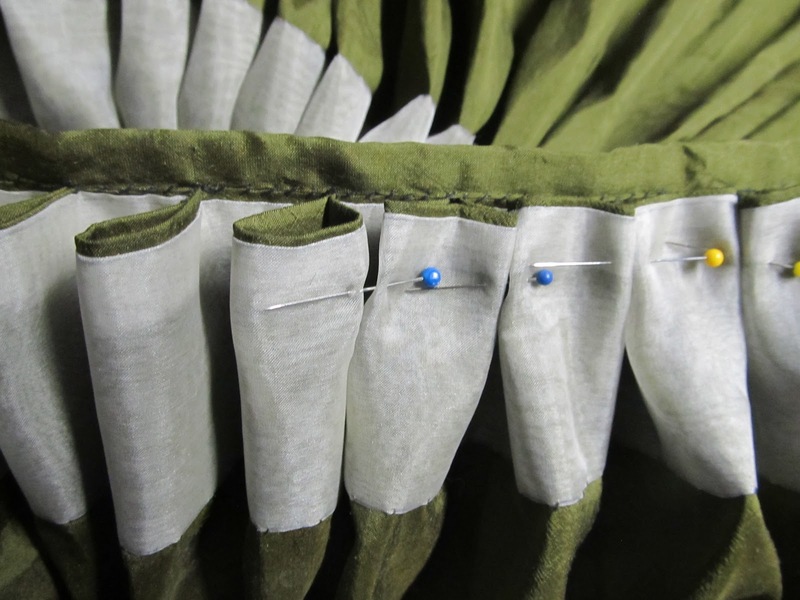 Although the skirt hem is not visible in the portrait I decided I should do something in keeping with the simple slashed piping on the bodice. I started by first hemming the skirt, and inserting a three inch wide piece of wool. I then made the guard using a four inch wide piece of silk, which was all that was left from trimming the skirt before hemming. I cut many strips of the black silk and much clipping ensued. Since I was using short pieces cut from scraps there were going to be many joins in the black silk. 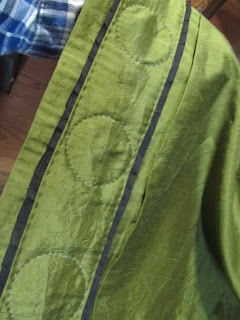 Instead of stitching the joins, I cut the ends of the pieces at the same angle I was cutting the snips and butted them up together on the green silk. After assembly is completed the joins just blend in with the rest of the snips. 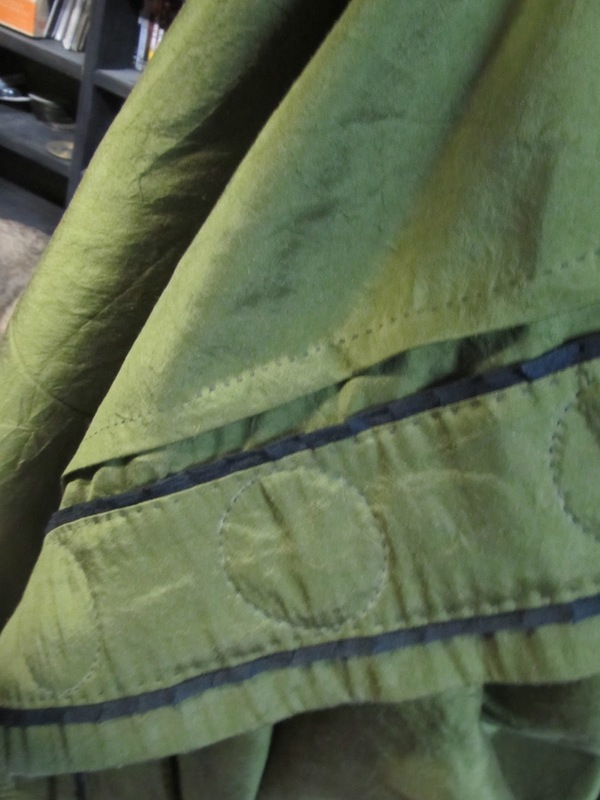 They are sewn onto the green silk with a half inch seam allowance and then the seams are folded back and pressed. I then inserted another strip of wool, pinned it in place and then hand sewed it to the skirt. I felt that it still needed something, but I reminded myself to stay calm and choose something quick and simple. I decided on a simple circular pattern kind of like the one on the hem of the orange dress in Susanna and the Elders (1517). Although the design in the picture is likely embroidered I decided to go subtler and 'quilted' the design on the guard through all the layers. I've gone all the way around once, leaving three inch gaps between the three inch diameter circles, and still need to go back and fill in the rest. I'm really liking how it looks so far, and pleased that its one of those details that can really only be seen close up. I also made the period tuck in the skirt, just a bit above the guard, as seen in the extant Eleanora and Pisa gowns and paintings of the time. 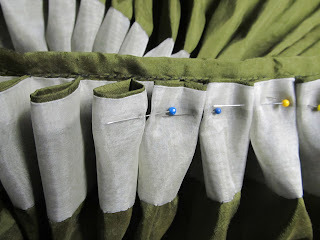 I've done this before on petticoats, usually because I accidentally made them too long to begin with. This is the first time I have purposely remembered to include it in the gown. Ands that's it for now. Been lazy and unproductive today, but will hopefully get some more circles sewn in before calling it a night.